Ah, Savasana. The last and most understated pose of yoga practice. 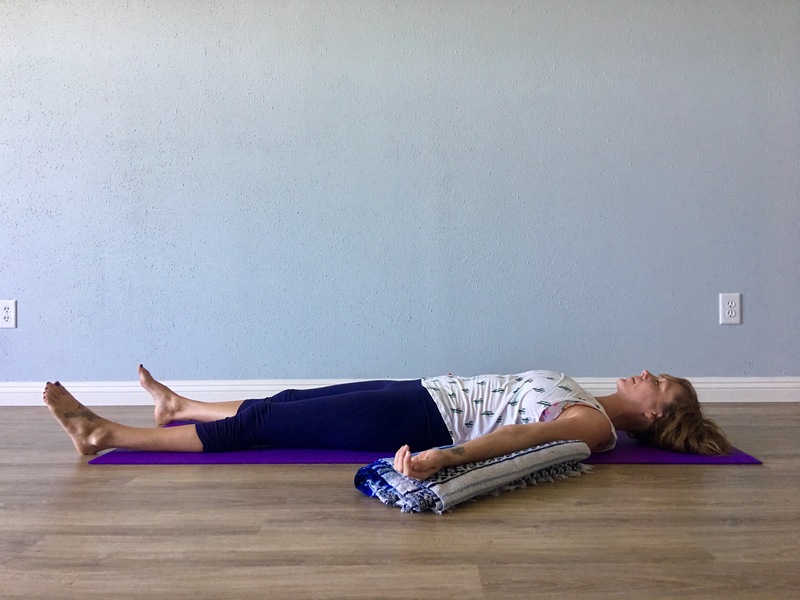 Why Use a Support in Savasana? The calming effects of resting in Savasana can be quite therapeutic, helping restore balance to the nervous system. But the key is totally letting go — releasing all physical tension in the body, which often requires a little bit of support. For the majority of us, lying flat on the floor creates tension somewhere in the body; and while you may feel completely comfortable in Savasana, the nervous system picks up on even the slightest amount of tension, staying alert. Placing something of appropriate size under the knees, low back, neck, or head often offers just the right amount of support to release as much muscular tension as possible, allowing the nervous system to unwind. 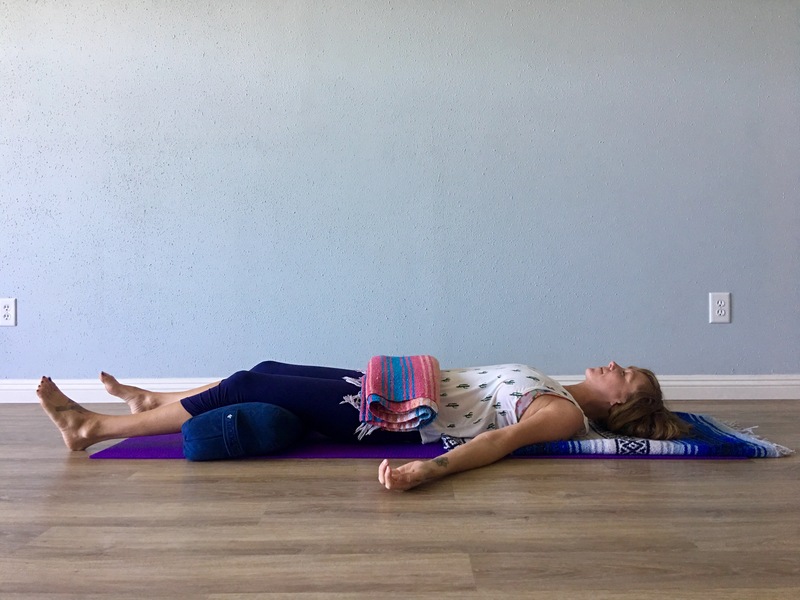 Below are five easy ways to help support a more therapeutic Savasana (remember to grab the props you’ll need for Savasana at the beginning of class so that when the time comes all you need to do is set up). And to really make the most of Savasana make sure to place something over your eyes, filtering out as much light as possible. If even the smallest amount of light hits the retina it activates, signaling the nervous system to stay alert. 1. Support the natural curve of your low back. Fold a blanket in half and then half again, making a large flat rectangle, and place it behind you on the mat with the round edge an inch or two behind your buttocks. When you lie back into Savasana, the round edge of the blanket should begin at your waist (just above the pelvis) — supporting the natural curvature of your low back — with the rest of the blanket extended beyond your head. If your low back feels more comfortable with more of an arch as you rest, or you naturally have more prominent curve, place a second twice folded blanket flat on top of the first. 2. Support your knees and hamstrings. Either roll up a blanket or place a bolster under your knees. Lying back, take a few breathes and notice the way your back feels. Play with moving the bolster up the backs of the legs toward your buttocks until you find the position that feels the most relaxing for your lower back. The combination of support under the knees and the blanket supporting the curve of your low back is really the way to go, but if you’re limited with props either or works great too. If you don’t have a bolster or a spare blanket, try placing a block under each knee (playing with the placement until finding the most comfortable position). 3. Support your neck. If you feel any tension in your neck or throat, or feel like your shoulders can’t relax back, try placing a neatly folded up blanket under the base of your skull. Lifting your head up in line with your shoulders, and lengthening the back of your neck, the extra support of the blanket will help relax your neck, throat, and jaw relax. Most students don’t realize that they are still gripping through the shoulders and neck until they place a blanket underneath their head. Some necks require more support, in which case placing a rolled hand towel underneath the back of the neck is a nice way to support the spine. You can play with the thickness of the roll to find the right amount of support for your neck. 4. Support your arms. 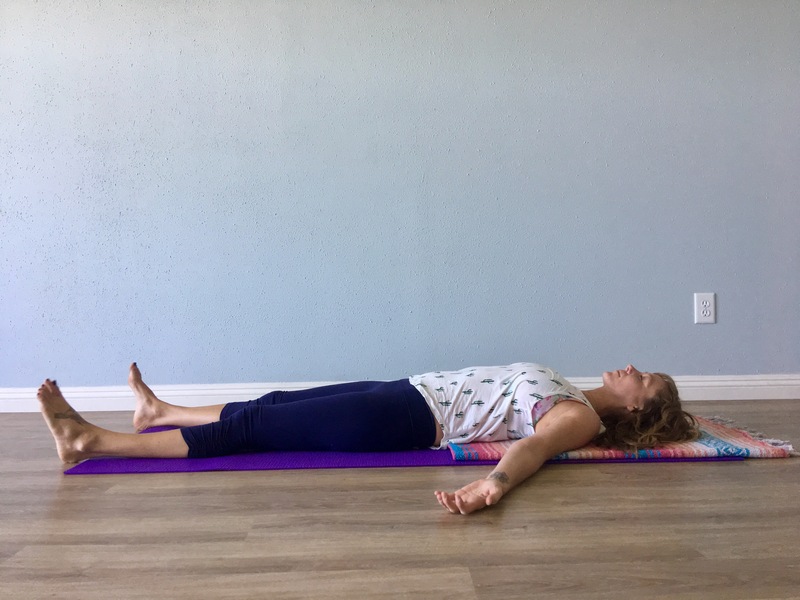 If your shoulders tend to round forward, lifting away from the floor in Savasana, it’s nearly impossible to completely relax your neck and upper body. One way to invite the shoulders to soften back is to support the under arms, slightly elevating them above the shoulders. With your arms down by your sides a foot or two away from your sides, place two flatly folded blankets under the backs of your arms with the top edges just above the elbows and the backs of your hands resting on the opposite ends. Play with the height of your arms, folding the blankets again as necessary, as well as taking your arms further out to the sides until the tops of your shoulders relax back. 5. Weight your body. Placing something on top of your body can help cultivate a grounding, inward sensation that can be both calming for the mind as well as emotionally soothing. 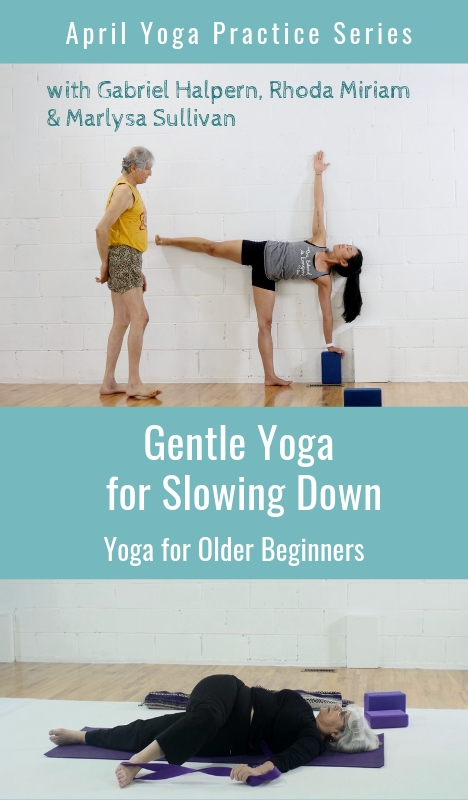 There are many ways you can do this: you can place a blanket (folded four times) across your low belly; or a block, either across or lengthwise. For an even weightier experience, place a bolster lengthwise down the front of your body. When you have time for a longer, more restorative Savasana try any combination of the above — or all five! Want to try another soothing yoga asana sequence especially for women? 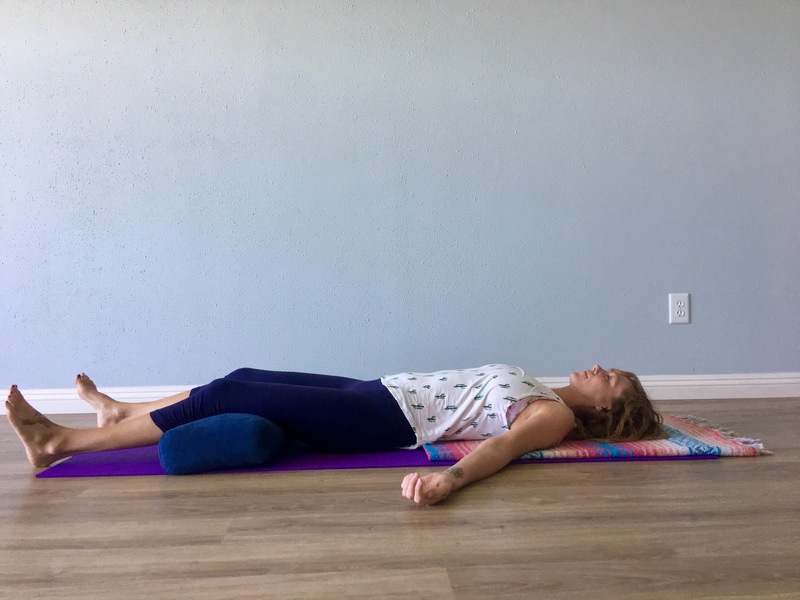 (Including a special restorative Savasana) Try this one brought to you by YogaUOnline and writer, Meagan McCrary-Yoga for Women's Health: Soothing Yoga Sequence to Ease Menstrual Discomfort. Who wouldn't want to study Savasana with YogaUOnline and Judith Hanson Lasater? Savasana: The Art of Doing Nothing. Meagan McCrary is an experienced yoga teacher (E-RYT 500) and writer with a passion for helping people find more comfort, clarity, compassion and joy on the mat and in their lives. She is the author of Pick Your Yoga Practice: Exploring and Understanding Different Styles of Yoga a comprehensive encyclopedia of prominent yoga styles, including each system’s teaching methodology, elements of practice, philosophical and spiritual underpinnings, class structure, physical exertion and personal attention. Currently living in Los Angeles, Meagan teaches at the various Equinox Sports Clubs, works privately with clients and leads retreats internationally. You can find her blog, teaching schedule and latest offerings at www.MeaganMcCrary.com.